A stronger player in a 9x9 teaching game recently told me that I shouldn't "hit below the shoulder" but should "hit above the shoulder". I am familiar with the concept of a shoulder hit but why is above better than below? Semantic comment. Stefan: In this month's issue of Belgo, the magazine of the Belgian Go Federation, Dieter writes why this is a bad move. I'm sure he'll add to the below, but from memory this begins to illustrate why the hit below is generally not a good idea. Shoulder hits are typically played against a stone on the third line. In isolation, the White shoulder hit on the second line looks like an obvious bad idea. If Black starts pressing at 'a' (with White extending at 'b' and so on), White is in much too low a position. This has also to do with the difference between the third line and the fourth line - White doesn't get enough territory for the third line influence Black gets. 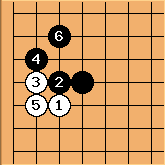 In a situation where tries to cooperate with other white stones in the area, it is rarely a good idea. One of the main reasons is that is usually good shape for Black, greatly reinforcing his stone in the area, while it does hardly anything for White. This is the kind of situation where the "good" shoulder hit from above might be useful. 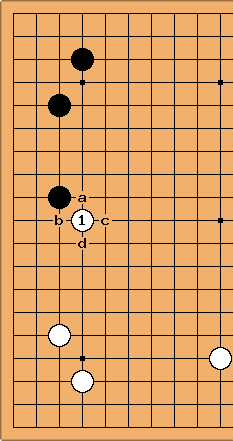 The main idea is to play a reducing move against a black framework in the upper left. Black usually pushes at 'a' or 'b', almost always followed by a white extension at 'c' or 'd' respectively. 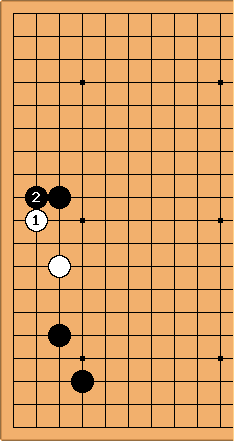 White manages to keep the expansion of the black structure limited, while constructing something towards the outside that cooperates with her other forces on the board. As usual there will be examples of a good shoulder hit on the second line. Notably in the endgame this may be a move making one or two points for you and stopping the same move from the opponent. In addition these comments are made with the 19x19 board in mind - on a 9x9 board there are usually little or no considerations about outside influence or the fourth line. There are various things to consider, let me point out only one. The shoulder hit is good shape, the angle play from below is bad shape. So why is this? 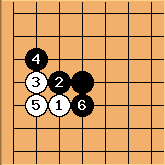 Here white develops nicely towards the center ( will often be played at a instead). Acceptable shape but black gets very strong. This looks like a way to get acceptable shape for white. Black gets wonderful thickness, however, and unless he now got overconcentrated at the top, this will be excellent for him. Often good for Black, too. 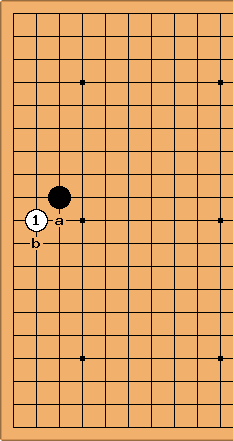 This shape is often good for Black, even if the ladder does not work. Dieter: The shoulder hit is named thus because when hitting the shoulder, one obviously hits from above. Otherwise it would be called an armpit hit or so. Both shoulder hit and armpit hit are examples of an angle play.